The needs of those with disabilities should be taken care of and we as a civilized society have the obligitation of letting these people live their lives without further and avoidable disadvantages. And being blind, deaf, having lost a limb or suffering from paraplegia is normally not a consicously self-inflicted act. Is Obesity Then A Disability? 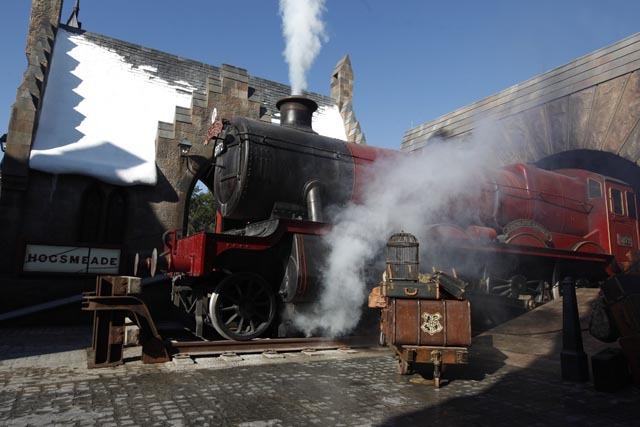 A Floridian Harry Potter theme park increased the size of seats in its rollercoaster, after apparently a good number of overweight or obese visitors complained to Universal, the company behind the park. These guests simply did not fit into the seats and couldn’t get the safety bar down far enough. Does changing the seats send the right signal? There is a tough piece of wisdom given to many fresh psychological therapists and counselors, about wanting to help when help is not being asked for: If the potential patient doesn’t seek help, he doesn’t yet suffer enough. You can translate this to only seeking help when you realize yourself that you need it. Let me illustrate this with the case of alcoholism: Some alcoholics get to the point where they can’t get or afford their drug themselves anymore and have to rely on a third person to fulfill their need. This person usually is at wit’s end about how to help the alcoholic, other than by keeping him barely functioning through providing his drug for him. Often they hope that the alcoholic will at some point realize what his drinking is doing to him and his loved ones, but as a neutral bystander we know that this only makes things worse and is a dead end. To really help the addict, the provider has to let him suffer from his condition. Obesity is a self-damaging condition as well, whose yearly costs in health care actually surpass those of tobacco addiction. Yet we do our best to accomodate the obese in their, shall I say it, food addiction. From clothing stores selling sizes with so many “x” that they aren’t printed out anymore, just accompanied by a number, “9XL”, to dentists having chairs that can carry up to 1000 lbs. This blog was created to chronicle my journey to get into shape and lose enough weight to be able to fit on the attraction Harry Potter & the Forbidden Journey at Universal Orlando. In order to be able to ride, the over-the-shoulder restraint must click down three times. At the time of starting this blog, I was able to only get two clicks. I never really had the motivation to lose weight or change my lifestyle, so I’m excited to see where this will go! To me, this is fantastic news! Even though I have lost the weight to get the three clicks in a regular seat, I’m still at a size where it depends on how hard the ride attendant pushes the restraint. There can be times where I can ride it, and then I’ll get back in line and not be able to ride. These new modified seats, I’m hoping, will guarantee that I will ride everytime. I invite you to wager where his motivation to lose further weight is now. Contrary to a paraplegic, he has the ability to change his condition. If he feels inclined to. Picture © 2010 Universal Orlando Resort. I share your opinion to a point; Although sometimes largely genetic, obesity is in most cases mostly a choise. required to make an informed decision to do something about it. Might sound kitschy, but I think it was really hearttouching that he wanted to ride that rollercoaster so bad. Well for me at least it was definitely a choice. No one made me obese, it wasn’t forced on me by uncontrollable circumstance either. My own habits made me greatly overweight and highly unhealthy. It was a choice in the end and I made the choice to get out of the situation i was in. I have to wonder though if accommodations like this were being made for me if I would’ve made the decision to change. So I’m quite glad they weren’t. Like Hjotur said though, I do feel sorry for young kids who don’t know any better. Their parents have the bad habits and they pass them on so its not so much a choice for the kids. In a way I was as I wasn’t happy with myself in the least but when it would get me down, I would just go eat something which just made things worse of course. In the end, I just kinda got tired of it and wanted to see if I could change. Started watching what I ate, tried walking every day, and saw the pounds start to come off and haven’t stopped progressing in one way or another since. Up to a certain age i dont think its a choice. A lot of children are fat because of their parents and others allowing their weight to get out of control. Being at a healthy weight is a choice if you have the motivation, noone would stop you losing weight but I dont think anyone actually chooses to be fat though, noone sane anyway. Yes, children don’t have much say in what’s put on the table. And no, being fat is not a conscious choice, it sneaks up on you. At least it did on me. This is great. I am actually doing a speech this week on American Obesity. If being obese is a disease then being lean is also a disease. It’s ridiculous to even think about this. Obesity is everyone’s responsibility. If your kid’s obese, then it’s your fault. Period. Do a search for “is obesity a disability?” – it’s a hotly debated subject. If obesity was truly a disease, why weren’t there so many over weight people 50, 60, or 70 years ago? Oh, right, they exercised back then. I think the biggest change was in the diet though. I can hardly believe some of the meals that are served in America o.0 I’m surprised an average person can finish! Yeah I’d definitely say the meal sizes getting bigger is a big cause. Whats worse though is the all you can eat buffets. I’ve seen people go up and come back with a couple plates stacked with a mountain of food. I can see how it would work in theory, a smaller container for the portion of food would make the serving seem larger so your mind would make you think you have more to eat. I do this for lots of my meals and it does work to a degree. However you’re right that it doesn’t quite work if you’re at a place where you can get as much as you want and know it. Whoa! At a BMI of 40 you actually already are in “morbidly obese” land. It felt like I woke up one day, 60 pounds overweight. I lost alot of weight when I started paying attention. It’s hard to pay attention when you eat what you are served. When you order a burger, and get 7000 calories and a gallon drum of soda to wash it down. In our busy days, I think it’s important to take a step back, and look at what we put in our bodies. And please stop comparing Europe and America. Great article as always, Evil. Whats awesome is you noticed it and did something about it. Most won’t even admit it unless something life threatening comes of it much less do something about it. Exactly, sean! We are so busy *doing* things that we hardly spend to think about *what* we actually are doing. Oh I love my state, between all the sweating and bugs people are bound to slide into a roller coaster- no need to widen the seats. Derek, for me Florida always translates to “Miami Vice”. I agree, Umar, there are companies out there who benefit from selling a lot of cheaply produced food.